A University of Michigan professor's turnabout on an ultra-sensitive issue brings "a strong warning that your behavior in this circumstance was inappropriate and will not be tolerated." The university now denies him a merit raise and cancels a sabbatical leave schedule to start in January, according to a four-page Oct. 3 letter signed by Elizabeth Cole, interim dean at UM’s College of Literature, Science and the Arts. Cheney-Lippold also can't go on sabbatical during the next two years, Kim Kozlowski of The Detroit News reports. The American culture faculty member could face additional discipline, including dismissal, for any similar incident in the future. "Your conduct has fallen far short of the University’s and College’s expectations for how LSA faculty interact with and treat students," according to Cole's letter, which The News got through the state Freedom of Information Act. "This letter is a strong warning that your behavior in this circumstance was inappropriate and will not be tolerated." To be clear, there are no University departments participating in [an Israel] boycott and in fact, the University formally and publicly opposes a boycott of Israeli academic institutions. President Mark Schlissel posts this letter. Separately, UM President Mark Schlissel pledges Wednesday in an open letter: "We are committed to upholding an equitable and inclusive environment." "Withholding letters of recommendation based on personal views does not meet our university’s expectations for supporting the academic aspirations of our students. "Conduct that violates this expectation and harms students will not be tolerated and will be addressed with serious consequences. Such actions interfere with our students’ opportunities, violate their academic freedom and betray our university’s educational mission." He set up a faculty committee to review a policy designed to keep employees' political beliefs from clashing with their responsibilities to students, Kozlowski writes in a Detroit News follow-up. Cheney-Lippold, who has a 2011 doctorate from the University of Southern California, rescinded his offer to write a foreign study recommendation letter for Ingber. 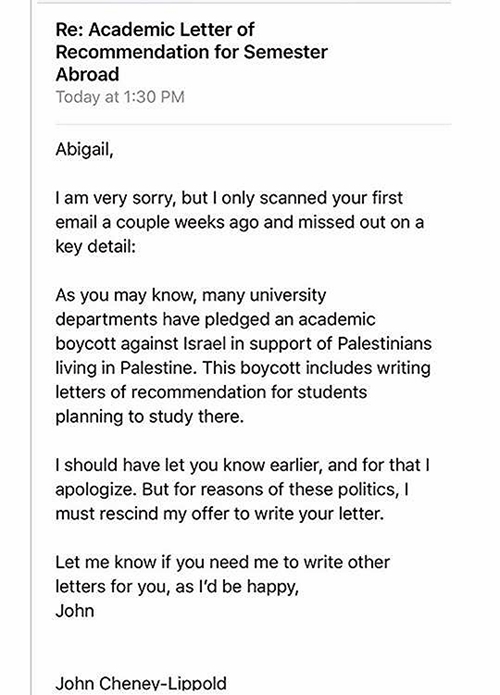 An email to her (below) cites "an academic boycott of Israel in support of Palestinians living in Palestine. This boycott includes writing letters of recommendation for students planning to study there. I should have let you know earlier." "I support the boycott because I support solidarity. I follow the idea that people who are being discriminated against or people who need help … I feel compelled to help them. I was following a call by representatives of Palestinian civil society to boycott Israel in a very similar tactical frame as South Africa. The idea is that I support communities who organize themselves and ask for international support to achieve equal rights, freedom and to prevent violations of international law. . . .
"I tried to keep to my conscience and to the fact that I believe that the boycott is a good tactic to enhance human rights and to get everyone in Israel-Palestine to have what international criminal court and the U.N. in general has requested, which is equal rights for everybody. "As a professor, I’m not just a machine writing things for people. I have opinions, and even though a letter of recommendation is about the student, a lot of thought goes into them. It's not a blank check where I'm signing for them to go to any place they want. "It is a dialogue. It's what the University is about -- talking through differences and really figuring out where each other stands, not expecting something or assuming something, but really trying to get into what is the key difference. Seeing what can we do more, how can we have a larger campus-wide discussion." Beautiful rustic church window/building face on 14th Street.